Feeling a little too stressed out lately? It’s time to pay close attention to your health. Scientific studies reveal that psychological stress can gravely affect one’s health. In fact, there are plenty of stress-related illnesses affecting millions of people around the world today. And failing to take action in reducing one’s stress levels can even complicate these health issues. Your doctor might suggest staying away from anything that stresses you out. But the truth is, it’s not that easy! Not all of us have the luxury to go on a vacation whenever we feel stressed out. Almost all of us have jobs and other responsibilities which require us to be present every day. There’s not enough time to do the things we want to do – much less time for relaxation, meditation or yoga, even if we know it is good for us. And although anxiety medication can be made available to anyone, it only solves the problem temporarily. What most people don’t know is that almost all of them have plenty of side effects once you stop your intake. With all this in mind, you may be wondering… Is it still possible to relieve stress in today’s busy world? The short answer is yes. What if there is a solution that does not take much of your time and effort? A solution that provides long-term results and does not have any adverse side effects? It may sound like a dream but the good news is that such a solution does exist, and it is the use of essential oils. The history of essential oil dates back up to thousands of years ago. Did you know that the very first known record of aromatherapy came from ancient China? According to historical evidence, they were the very first people who used essential oils as a mood enhancer. They believed that the medicinal properties of herbs and plants are also carried out via its aroma. It’s difficult to trace the tracks of aromatherapy in history. But one thing’s for sure – it is still popular today as it was thousands of years ago. According to modern-day scientists, essential oils have fragrant aroma molecules that can pass through our bloodstream when inhaled. These molecules make their way through our lungs and eventually, into our brain. These molecules then trigger certain effects on the chemistry of our brains, influencing our mood and feelings. 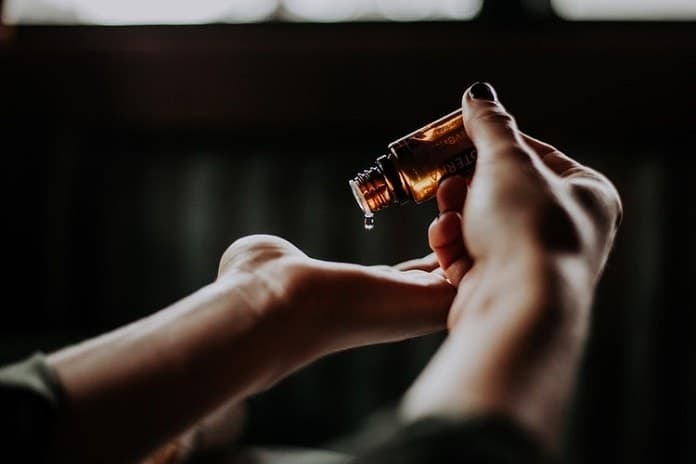 A study by the Ruhr University in Bochum, Germany states that essential oils may affect a number of biological factors, including blood pressure, stress levels, heart rate, breathing, and overall immune function. With that in mind, it’s safe to conclude that essential oils are indeed effective in relieving stress. But the best part of it all is that essential oils are a natural cure; it is a lot safer and more effective than artificially-produced medication. Another great fact about it is that it can be used in more than one way. You can add it to your diffuser, you can inhale it or you can even incorporate it into a mixture and create your own handmade cosmetics. This means that you can use essential oils more often than any other stress-relieving option out there. There is a huge variety of essential oils available out there today. And with so many interesting scents accessible, choosing a bottle may be quite daunting and confusing. When thinking about natural fragrances, one would automatically think about flowers. And which flower is more popular than the rose? Roses are considered to be one of the most beautiful flowers in the world and they symbolize love and romance. But they aren’t just beautiful to look at or something to give as a present to a special someone – they are also very good for one’s health, especially as an essential oil. Researchers show that rose oil has plenty of medicinal properties. They are antidepressant, antiseptic, antispasmodic, antiviral, and aphrodisiac to name a few. Rose essential oil is procured via steam distillation of a Damascus rose and it is said to be very effective as an antidepressant. If you’ve been feeling down lately, try adding some rose oil into your diffuser as it can help lighten up your mood. Apart from being an antidepressant, rose oil also has the ability to cure headaches. Being exposed to a lot of stressors in the office can cause you to have a migraine. But don’t worry, a few drops of rose oil can solve it. Rose oil must be used in small doses, especially when used to treat headaches. Due to its very strong aroma, a simple headache can worsen when using a rose oil in high concentrations. It is also good to note that pregnant women should not use this oil as well since there is no concrete evidence of the effects of rose oil on unborn babies. Yuzu, also known as Citrus Junos, originated in Japan and has been used in various ways for many centuries. For those who aren’t familiar with yuzu, it is basically a citrus fruit that is a cross between a mandarin and a grapefruit. It has a refreshing scent that is almost like a lemon as well. This essential oil isn’t only a great pick-me-up, it is also said to be quite beneficial for your respiratory health. Yuzu essential oil is best used when you are feeling tense and worried, it will help stop the buildup of stress and give you the calming break you need. In the workplace, you may want to use this oil whenever you feel lost or overwhelmed. The refreshing citrus scent isn’t just calming, it also helps you clear your thoughts for new ideas to arise. Additionally, yuzu essential oil can also alleviate congestion. Use this oil when you feel like you are about to catch a cold. The oil from a yuzu plant is procured by cold pressing its peel. This oil should be used sparingly, you should add only 2-3 drops into your diffuser or personal inhaler. Just like many other essential oils, it may not be safe to use this oil in bigger doses. If would like to use this oil on your skin, do not apply directly from the bottle. Add a few drops to a cream or lotion, or you may also add some to your favorite mist. Everyone usually starts off with a bottle of lavender oil. It is considered to be the most basic must-have for anyone who wants to start their own essential oil collection. Lavender oil has numerous health benefits. It is a favorite among many essential oil users especially because it has such a gentle, calming scent compared to many other oils with strong aromas. Studies show that inhaling lavender oil is very effective in calming the nervous system, and so it is often referred to as the best essential oil for anxiety. This oil is also popular for those who suffer from insomnia – the relaxing effects allow the person to fall into deep sleep. Use a few drops of lavender essential oil to create your own handmade cosmetics. Just like other essential oils, remember to use lavender sparingly as higher concentrations tend to become unpleasant to inhale. Lavender oil is also an anti-inflammatory oil so it is perfectly safe to use on the skin for massage purposes. Oftentimes, we see bergamot as an ingredient in several perfume brands. But it isn’t just because of the luxurious aroma that makes it a great perfume, it also a deodorant. And although many people know bergamot mostly for its natural fragrance, bergamot oil also have plenty of health benefits – especially for people who are feeling very stressed. Have you noticed that some scents can just make you feel relaxed? According to science, bergamot oil contains flavonoids that are very good relaxants. These flavonoids reduce nervous tension and can also cure ailments such as insomnia, high blood pressure and even depression. Bergamot oil can also stimulate hormones such as dopamine and serotonin, making you feel calm and sedated. Although bergamot can be used in many different ways, it must also be used sparingly. Add a few drops to a diffuser or you may also add a few drops to your skin as a perfume. Bergamot oil is also safe for drinking but you must only add a little to your drink. Try adding 2-3 drops of bergamot oil to your tea for aid in digestion. Chamomile is better known as a tea rather than an essential oil but this doesn’t mean that it isn’t as effective in calming the nerves. Just like sipping a cup of warm tea, using chamomile oil can also provide the same gentle and relaxing vibe. This floral oil is best known for its gentle aroma which is why it is also a great combatant against stress and anxiety. You may have heard that drinking chamomile tea is great for digestion. It is also an oil that can effectively remove toxic agents. But this oil isn’t just about cleaning our physical bodies, it also has the capacity to clear out our mental health as well. It is said that this oil can alleviate feelings of depression while inducing a happy and refreshing emotion. Chamomile oil is extracted from the chamomile plant. To use chamomile oil, you can add 1-2 drops of the oil to your favorite lotion or cream. This oil is also safe to ingest so you might want to try adding 1-2 drops into your tea if you haven’t been sleeping well. One may have thoughts of Christmas when thinking about frankincense oil. This just goes to show how long the history of frankincense really is. Since many centuries ago, this oil has been used by our ancestors for its medicinal properties. Recently, it was even discovered that this oil is great for preventing cancer. According to medical research, inhaling frankincense can effectively reduce one’s heart rate and high blood pressure as well. Because of this, frankincense is also considered to be quite functional in relieving stress and anxiety. It is also said to be able to reduce symptoms of depression. But unlike many prescription medicines, using frankincense as a way to cure depression does not have any dangerous side effects. Just like all other essential oils, it is best to use frankincense in smaller amounts. A few drops go a long way. You can add this oil to handmade cosmetics or you can just add a few drops to your diffuser. Frankincense is also safe to ingest but please follow instructions on the label when experimenting with beverages. The ylang-ylang tree, or also known as the Cananga odorata, is commonly found in certain Asian and South Pacific Island rainforests such as the Philippines, Indonesia, Java, and Polynesia. Despite having a strong and unique aroma, its flowers have an alluring floral scent that can prove to be quite effective in reducing stress and anxiety. The ylang-ylang is said to have antidepressant properties. It is a sedative substance that can lower blood pressure and protect wounds from bacteria and infection. According to research, this plant is also very healthy for one’s nervous system. It can effectively reduce tension on the nerves and protects them from developing disorders of the nerve. As mentioned above, the ylang-ylang essential oil is very fragrant. Using too much of this oil at once may not smell very pleasant to inhale and may even cause headaches. Apart from using a diffuser, it is recommended to add a few drops of this oil to bath water in order to dilute its strong fragrance. If you would like to apply this to your skin, make sure to use a carrier oil before doing so. This oil is also healthy for the scalp and it can also heal scars. Using essential oils to relieve stress has become very popular over the years. Not only is it easy to use, it also does not have any adverse side effects compared to prescription medicine. There are plenty of oils that provide relief from stress and anxiety and it might be difficult to choose just one. Pick an oil of Best Essential Oils For Stress with a fragrance that fits your personal taste and your needs as well.